The year 2017 was full of events and developments in the world and also at Charles River Zen. The Abbot and Vice-Abbess of the center would like to extend their gratitude on behalf of all sangha members and visitors who helped with the sittings, events, and who come to practice with us. On November 25, 2017 Shinge-shitsu Roko Sherry Chayat Roshi bestowed inka shomei on Kyo-On Dokuro Osho, naming him her first Dharma heir. Our deep respect and gratitude to Shinge Roshi for her leadership of the Zen Studies Society and for passing on that which cannot be transmitted, to the next generation of Rinzai Zen in the Hakuin Ekaku, Takuju Kosen, Soen Nakagawa lineage. We were greatly honored by the presence, kindness, and congratulatory words by Donge-shitsu Shunan Noritake Rodaishi, abbot of Myoshin-ji’s Reiun-in and of Rinzai-ji in Los Angeles, by his generous gifts including poetry and calligraphy and more. We also are grateful for Noritake Roshi’s hospitality during our visit to Japan in October, when Shuko and Dokuro were invited to join Shinge Roshi in attending the 250th Anniversary Celebration for Hakuin Ekaku Zenji at Ryutaku-ji in Mishima and to visit Reiun-in and Myoshin-ji in Kyoto. Deep bows to Nankei Okajima Osho from Honko-ji in Kyoto, her wonderful energy and presence, and for the generous gifts which she presented on the occasion of the Dharma Transmission Ceremony. Dokuro also thanks the four gates, Hogen Heribert Harter Osho from Bodhidharma Zendo Augsburg, Myoren Kumiko Yasukawa Zenni, Shika (head monastic) at Rinzai-ji in Los Angeles, Juyo Dennis Giacomo Zenji, General manager at Dai Bosatsu Zendo, and Myoho Brenda Miller Zenni, gardener at DBZ. Thank you to all who participated in the ceremony and made it possible: Kimpu Jonathan Swan Zenji, Shika at DBZ, Sozan, Tozan, and all the many hands that were needed for this event. Special attendees from far away included Seigaku Kigen William Ekeson Osho from the Bodhidharma Zendo in Vienna (Austria), Muichi Osho from Honei-ji in Saitama-ken, Zengetsu Myokyo Judith McLean Osho from Enpuku-ji in Montreal (Canada), Jiun Veronika Katona from Stainz (Austria), Junryu Eran Vardi Roshi and Rev. Myogen from Eiryu-ji in New Jersey, Dokan Charles Martin Zenji, Shika at Mt. Baldy Zen Center, Ginsei Ginger Calloway Zenni, Oren Beth Shaefer Zenni, Koshin Susan Crozier from Rinzai-ji, and many more. Thank you for being a constant presence at the Zendo to Jodo Franco Deangelis Koji, good luck to Tangen Brian Canning Koji and Giten Maat Manninen Koji, whose life paths took them from the Boston area to other places in the United States. A special thanks to James Murdock and Virginia Toner for their long-lasting practice, support, and dedication. Last, but not least, our thanks to all who have contributed generously by their presence and financial contributions. Just a few days ago the calendar turned over and a new year of 2017 began. Sometimes it is helpful to take a look back at the elapsed year and to draw a summary that helps us understand how the Charles River Zen sangha spent their time during that year. Once again, we had a physical change of location, but not too dramatic this time: within the Watertown Center for Healing Arts we moved to the Skylight Studio. The move required that we change the entrance to the building: for access to the Skylight Studio we now enter at 22 Mt. Auburn Street. As the Abbot of Charles River Zen I am submitting this report of the CRZ activities and the Abbot’s activities to you and extend a heartfelt Thank You for all of your help and dedication. Zen practice in the Japanese Rinzai tradition is not easily found in America. There are only a few places and sanghas that offer access to this style and format of practice. At Charles River Zen we strive to establish a permanent place for this practice in the Boston area. To allow for that to happen we need to build the sangha, membership, and to raise the needed funds to accomplish the goal. All of this is done without advertising – we only make our presence known without the intent to pull in individuals. From our own history and practice we know that those who gravitate towards this deep practice will show up at the doorstep and enter. In 2016 Dokuro continued to engage in advanced training under Shinge-shitsu Roko Sherry Chayat Roshi, the current Abbot of the Zen Studies Society. Along with her husband, Shuko-san, the Vice-abbess of CRZ, also attended sesshin at Dai Bosatsu Zendo as well as in other locations around the country. Altogether Dokuro spent 36 days in sesshin, gave 12 Dharma talks at retreats at Dai Bosatsu Zendo, New York Zendo, Haku-un Ji in Tempe AZ, and at Syracuse University. At Dai Bosatsu he led one Intro to Zen Weekend, Soen Shaku sesshin at New York Zendo, and a three and a half day zazen-kai at Haku-un Ji. Dokuro and Shuko traveled to Rinzai-ji in July to participate in the commemoration of the anniversary of Sasaki Roshi’s passing. With the conclusion of the Sanki-kai (third service) the official remembrances came to a conclusion. In all services, beginning with the private service before cremation, the official funeral, and the two following annual services Dokuro had the honor to serve as the Ino, chanting the dedications and reading translations of Noritake Roshi’s ceremonial poems. In July the official ceremony making Donge-shitsu Shunan Noritake Roshi the Acting Abbot (kenmu jushoku) was celebrated at Rinzai-ji. Another great event was the participation at the Dual Anniversary: 40 years Dai Bosatsu Zendo and 60 years Zen Studies Society, which was held at Dai Bosatsu Zendo on July 3. Noritake Roshi returned to DBZ for the last day of the Anniversary Sesshin and gave a speech at the Anniversary Celebration. In February we began to post Dokuro’s talks on soundcloud.com, a service that allows listeners around the world have free access to the talks. A total of 29 talks were posted so far and they were played 1,145 times over the course of the last ten months. Our social media presence has increased with a Facebook Page and Dokuro’s brief Dharma words on Twitter. Charles River Zen is a small place and in the context of the Boston area we rely on contributions to our organization to keep operations possible. Dokuro and Shuko freely give their time to make this group possible, as do those who come and support the group as time-keepers, tea-servers, and through membership contributions. All that said, CRZ has been operating with a loss for the last few years and our modest reserves are shrinking. Please support us with your donation of any amount. Thank you! Daito Kokushi said in his final admonition 光陰矢の如し (Kōin ya no gotoshi), “Time flies like an arrow,” and it is exactly the experience that many of us had over the last 15 years. How fast time slips away, tomorrows become yesterdays, and yesterdays become yesteryears. On July 2001 the Articles of Incorporation for Houn-an Dharma Cloud Hermitage Inc. were submitted to the Secretary of the Commonwealth of Massachusetts. The stamp on the submitted papers show that they were accepted on July 5th, 2001, and the temple began its official existence. 15 years have since elapsed, flown by, full of events and change. Between 2001 and 2004 Dharma Cloud Hermitage organized Zazen at Boston University, where Dokuro served as the Buddhist Chaplain. A few students came, but also practitioners from outside the university. With a turnover of residents at the Cambridge Buddhist Association in May of 2004 Houn-an was invited to take on the Zazen-kai at the CBA, which was founded in 1957 by D.T. Suzuki, Elsie Mitchell, Shinichi Hisamatsu, and a number of other remarkable individuals. 2004 was also the year when Dokuro underwent Suiji-shiki (Temple Dharma Transmission) and became one of Joshu Roshi’s Oshos (Zen Teachers). We had the privilege to organize the Zen activities at the CBA until the summer of 2011, when the property in Cambridge was sold and Dharma Cloud Hermitage needed to move on. Since the fall of 2011 we have had the great luck of being able to offer our sitting under the umbrella of the Watertown Center for Healing Arts, first on Main Street, and for a few years now at 17 Spring Street in Watertown. The setup is quite different from a permanent location with a zendo that is ready when we arrive. We create the zendo space, setting butsudan and cushions, sitting, and in the end disassembling and erasing all the clues that we were there – a great lesson in non-attachment, but admittedly also a sign that Rinzai Zen practice yet has to find firm grounding in this area. Where are we going? What is the vision of this group? What are our aspirations in offering this path in this particular area? These are all important questions that I would like you to contemplate. There is one fact that I have learned over the years and that is that centers do not flourish just by the energy and acts of a few – in order for them to fully reach their potential and develop a committed sangha has to form end evolve. Any meditation center that is fully dependent on the work of just a few people will not thrive, those who long for this practice are the most important contributors of energy, material and financial support. Dharma is everywhere, it is priceless – but for us humans to create a community requires effort. Having the opportunity to create a place where human maturation, spiritual inquiry, and opening of hearts and minds takes place is an awesome responsibility. Please come forward if you have this longing for practice and are willing to do a part in making a Rinzai Zen meditation center in the Boston area become a reality. We have closely watched attendance at out meetings over the last few months and in too many cases our Monday sittings have not yielded the attendance necessary to justify the space rental expense. For that reason we will begin our summer schedule (Wednesday evening sittings only), effective in the second week of May. This consolidation of attendance may help strengthen the group and create momentum to examine our future. In addition it will help in conserving the small financial reserves our organization has by avoiding unnecessary rental charges. This year the sangha of Sasaki Roshi commemorates the passing of the master with a Hō-on Sesshin that begins with Hashinkyuji on Monday, July 25th, 2016, Banka at 4:00 p.m. The sesshin goes from July 26th (Tue) through 30th (Sat) and is held at Mount Baldy Zen Center, Mt. Baldy, California. You can sign up online. There will also be a Memorial Service (Sankai-ki) on Sunday, July 31st, 2016 at 11:00 a.m., followed by a catered lunch reception at Rinzai-ji Zen Center. Noritake Roshi, the Abbot of Reiun-in at Myoshin-ji, Kyoto, will be leading the ceremony. Dai Bosatsu Zendo Kongo-ji is celebrating its 40th anniversary this year, and the Zen Studies Society turns 60. To commemorate these occasions a week-long 40th Anniversary Sesshin is held, lasting from June 25 through July 2, 2016. Noritake Roshi will also participate in these events, giving a teisho on July 2nd and addressing the guests during the July 3rd celebration. The celebration will include a ceremony, talks by eminent D.T. Suzuki scholar Richard Jaffe and as a keynote speaker Buddhist author David Loy (A New Buddhist Path: Enlightenment, Evolution, and Ethics in the Modern World). The day will conclude with a meal cooked by Seppo Ed Farrey, the author of 3 Bowls: Vegetarian Recipes from an American Zen Monastery. After returning from Holy Days Sesshin at Dai Bosatsu Zendo I made a quick trip to Syracuse to visit Hoen-ji, Shinge Roshi’s home temple, and to give a brief talk at Syracuse University’s Hendricks Chapel entitled ZEN: There is no app for that. Spiritual Practice in the Age of the Smartphone. It was nice to sit the last period of Zazen of the Spring Sesshin at Hoen-ji, meet the Syracuse sangha, and speak at the chapel, where Jikyo-san works as the Buddhist Chaplain. For Memorial Day I will be traveling to Hakuun-ji in Arizona, where I was invited to lead the three and a half day Zazen-kai. I look forward to this opportunity and to visit my dear and late friend Sokai’s place, commemorating his dedication to Zen practice and Joshu Roshi. Myoki’s life circumstances have made it necessary for her to move from the Boston area. This happened quite quickly, and in mid-February the move occurred. On behalf of the CRZ sangha, Shuko and myself, I wanted to thank Myoki for her presence, participation, and everything that she has done to enrich the life of the Charles River Zen sangha. We know that she has great opportunities where she moved, and that there is a way forward for her in her Zen practice right there. We also look forward to seeing her at sesshin, wherever that may be. On Sunday, December 13, 2015 we held a day-long “Awakening Retreat” to commemorate the awakening of the historical Buddha about 2,600 years ago. After sitting in meditation for seven full days at the sight of the morning star at the dawn of the eighth day Siddhartha Gautama awakened and became the Buddha. Eleven participants spent the day sharing the same space, chanting, sitting in meditation, walking meditatively, listening to a Dharma talk and engaging in individual meetings with the abbot, Dokuro. Since December 6 Dokuro is – besides having been an Rinzai-ji Osho for almost 12 years – also recognized as an authorized Dharma teacher in the Zen Studies Society and is now empowered by Shinge Roshi to offer formal dokusan/sanzen as part of the practice at Charles River Zen. It was heartening to welcome three new participants to the retreat and see how the presence of authentic Rinzai Zen in the Boston area enriches the local Buddhist offerings. From December 1st through the 8th Dokuro Osho participated in the Dai Bosatsu Zendo Kongo-ji Rohatsu Sesshin, led by Shinge Roshi. The weather was unseasonably warm, only a few days were below freezing, so were the nights. The silence and stillness of nature in this part of the Catskill Mountains is astounding. Nowhere else have I ever heard in such vivid clarity the sounds of a paddling of ducks departing from the stillness of the lake, or heard the sound of an airplane passing over the area at 36,000 feet. The clarity of the air at night makes the sky brim with stars, shining their ancient light on the followers of the way sitting extra zazen on the deck around the Zendo. For the last four days of the sesshin I sat next to Shihou Osho, who trained at Ryutaku-ji in Mishima – he came to spend some time with us in Rohatsu. Always sitting in full lotus posture he displayed how Japanese unsui in training monasteries sit, how they chant, eat, walk and so on. To the satisfaction of many of the Westerners participating it was nice to learn after the end of the seshin that he found it challenging. I am now a member of both the Rinzai-ji family (as a Rinzai-ji Osho) and the Zen Studies Society as an authorized Dharma Teacher. Shinge Roshi was so kind to hold an acknowledgment ceremony on the sixth day of Rohatsu, on which I also delivered the Dharma talk. My deep gratitude to Shinge Roshi and all others in the Zen Studies Society, who so warmly welcomed me into their family. I hope that Rinzai-ji and the Zen Studies Society will find a way to work together and help Rinzai Zen in America flourish. It has been some time since you have heard from us with updates of what is happening around our Rinzai Zen Community. Today I am pleased to write with some exciting updates, that will have significant impact on the practice we offer at Charles River Zen. As many of you may know, after Joshu Roshi stopped teaching, I started to attend Sesshin at Dai Bosatsu Zendo, Kongo-ji, in the Catskill Mountains. Shinge-Shitsu Roko Sherry Chayat is the Abbot of the Zen Studies Society and leads the Sesshin at DBZ. Shinge Roshi and I met first in 2010, when she visited as a guest teacher at the Cambridge Buddhist Association where I served as the Abbot. We kept in touch from then on, and with Joshu Roshi retiring from formal teaching I decided to continue my training with the Zen Studies Society and Shinge Roshi. When Joshu Roshi passed away last year, I became officially a disciple of Shinge Roshi and commenced formal training in the ZSS tradition. Last May, after a Sesshin at Dai Bosatsu Zendo, Shinge Roshi announced that she will be giving Dharma Transmission to me on a specific date, in January 2016. Since then and over the course of the recent past Shinge Roshi and I, in consultation with other senior leaders of the ZSS, have come to the decision and agreement to extend the time that my advanced training in the ZSS tradition will last. It is important to us to go through the entire traditional process to become a Dharma heir. The formal training includes completion of a prescribed koan curriculum and familiarization with the responsibilities and duties that a ZSS lineage holder assumes. It is a privilege for me to be chosen to go through this process, to walk the traditional path to become a Rinzai Zen master, and I feel that with the commitment to pass through these Dharma gates I am honoring and retracing the steps which our Zen ancestors and living Zen masters took to become authentic representatives of this wonderful tradition. At Rohatsu Sesshin this year I will officially be welcomed into the ZSS family as an authorized Dharma Teacher; the combination of this recognition with having been a Rinzai-ji (and therefore Rinzai Zen) Osho for some eleven years, will also empower me to offer formal dokusan and thus enrich our practice with one of the most fundamental ways of teaching Rinzai Zen. In the Four Great Vows we chant HO MON MU RYO SEI GAN GAKU – how ever innumerable the Dharma gates are, I vow to pass them all. I ask all of you for your support in these further steps of the training for this Zen monk Dokuro, and for your continued practice and participation in this great new chapter in the growth of Charles River Zen. As we have moved into 2015 it is time to acknowledge and thank those who have given their time and commitment to Charles River Zen. We wanted to thank Jodo for his ten years of faithful service as the treasurer of our non-profit organization. Jodo has managed the financials from our early days at the Cambridge Buddhist Association through our moves to various locations in Watertown. As a token of appreciation we have presented Jodo with a framed print of Bodhidharma by Sengai Gibon (1750-1837). Jodo also celebrated his tenth anniversary having taken Jukai and having received his dharma name. Congratulations to a steadfast practitioner! The Diamond Sutra Weekend in November was a great success. It would not have been possible to break even without the generous donation of an unnamed donor who covered the travel expense and honoraria for the two presenters, Prof. Hori and Prof. Roth. Many thanks for the generous donation that made the workshop possible. Jodo Franco DeAngelis, Myoki Monica McTighe, Eigetsu Theodora Francis, Maat Manninen, Patrick Mair, and the vice-abbess Shuko M. Rubin Jaeckel. We give great thanks to the ancestors in the lineage of Zen that follows Rinzai Gigen, and the living Zen masters who manifest living Buddhism and Rinzai Zen. Deep gratitude to the late Kyozan Joshu Roshi, his life, which was dedicated to the teaching and the manifestation of the way of Rinzai Zen. Deep gratitude also to Shinge Roshi of the Zen Studies Society, who has taken in our group at Dai Bosatsu Zendo Kongo-ji and generously shared her teachings and guidance. We are expecting more snow, and it has not been letting up! To keep everyone safe we are canceling the sitting for Monday, 2/9/15 – travel is too dangerous, stay home, sit by yourselves. We will resume our regular sitting schedule on Wednesday, February 11, in the evening. Over the last weekend we held a wonderful workshop with the Diamond Sutra as the central topic.There were about 29 participants and a few visitors who dropped in to hear some of the lectures. We arranged the workshop at the Providence Zen Center in Cumberland Rhode Island. 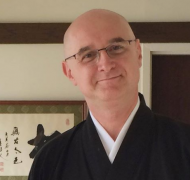 The current director of the facility is Paul Sonia, who has been practicing within the Kwan Um School for the last couple of years, but who also served as the director at the Albuquerque Zen Center and has been a long-term student in the Rinzai-ji tradition. The staff at PZC was very friendly and accommodating, the meals were wholesome and delicious. The participants came from near and far, including North Carolina, New Mexico, New Jersey, Quebec, New Hampshire, Massachusetts, and Rhode Island. The program included morning chanting and sitting and each of the meals was preceded by half an hour of zazen. Each day closed with more sitting and a chant and the zendo was open all night for sitting. Silence was kept between the end of the last lecture in the evening and breakfast the next day. It was a treat to have Sōgen Victor Hori and Kendo Hal Roth speak about Buddhism, Emptiness, and the Diamond Sutra. The lectures pointed out the historical development from Abhidharma (Sanskrit:अभिधर्म, Chinese:阿毗达磨) to the Madhyamika (Sanskrit: मध्यमक, Chinese: 中觀派) school and made relationship between the teaching of Emptiness to Zen practice and how it relates to the Rinzai Zen koan practice. Many contributions from the participants were added to the presenter’s expertise, and a reading of the text of the Diamond Sutra complemented these activities. We hope to organize further workshops in the future to not only allow for the study of the major texts that influenced Zen but also for deeper practice and understanding of the historical roots of Zen. The workshop closed with everyone chanting the Heart Sutra, which was dedicated to our late teacher Denkyo-shitsu Kyozan Joshu, Roshi. Residential Zen training and formal Zen practice in a dedicated practice environment is a unique and intense experience. Charles River Zen invites you to join in such an experience when we visit the Rinzai Zen monastery International Zendo Dai Bosatsu, Kongo-ji in the Catskill mountains. We had originally planned for this visit earlier in the year, but excessive snow drifts made the center practically inaccessible. will have a true taste of Rinzai Zen practice. In order to secure a spot please send a non-refundable deposit of $100 or bring it to one of the sittings. The total cost for the weekend is $175 and reflects a group discount that Dai Bosatsu Zendo and Shinge Roshi is generously extending to the Charles River Zen sangha. Beginners as well as long time practitioners are welcome to join. According to the number of participants we will most likely have several vehicles making the trip. If you wish to offer others a ride in your vehicle, please let us know and CRZ will pick up the fuel cost. Don’t let this exceptional opportunity go by! We look forward to have you join us for this excursion into the world of residential Zen training. Please note that we are cancelling the sitting tonight, Wednesday, February 5, 2014, because of the winter storm situation. Take your cushion at home, put it in your regular spot and join the sitting in spirit from anywhere on the planet – not even an Internet connection is needed. We look forward to seeing you in one of the future session. Nothing from April 25, 2019 to June 24, 2019.